This page will introduce the Wadden Sea area. There is a wealth of information online about this amazing landscape. Links will be made to that. 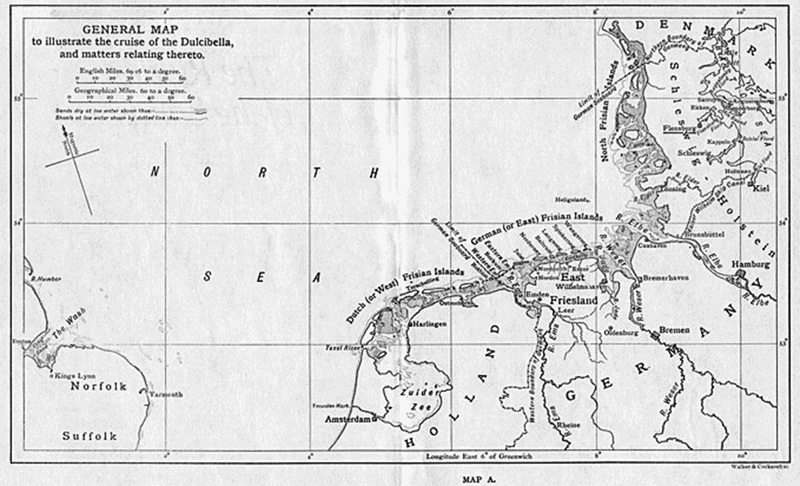 I will start with a quote and map from the early 20th century novel – The Riddle of the Sands by Erskine Childers. This famous spy/adventure story – alongside some of its dubious jingoistic politics – has a lot of detailed descriptions of the sands and channels of the Wadden Sea and of the business of sailing amongst them. “The yacht lay with a very slight heel (thanks to a pair of small bilge-keels on her bottom) in a sort of trough she had dug for herself, so that she was still ringed with a few inches of water, as it were with a moat. The Wadden Sea is a very unique tidal landscape that runs along the Dutch, German and Danish North Sea Coast.